I went to Ariya’s yesterday for only the second time ever. It’s moved from it’s previous home in MBK to Q House Lumpini, next to the park. It’s a tiny raw food cafe. I am going to try to get to the Meet Up that’s happening there next weekend. This was the secret salad. 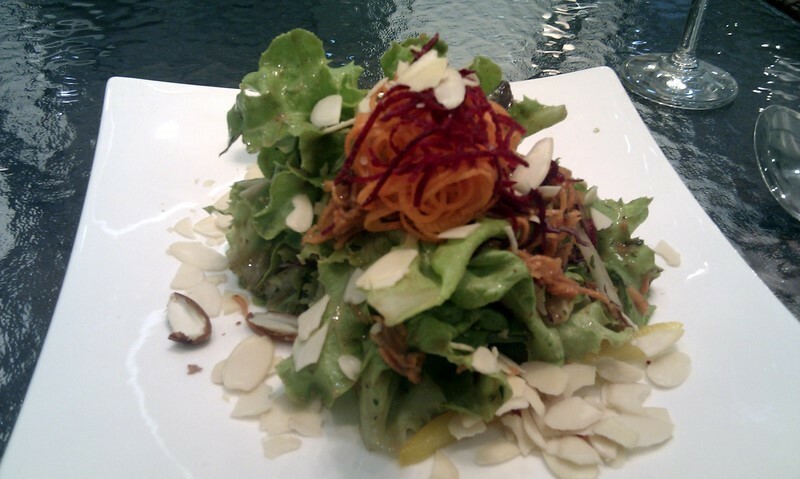 The dressing was made from ginger and lemongrass. My favourite item. 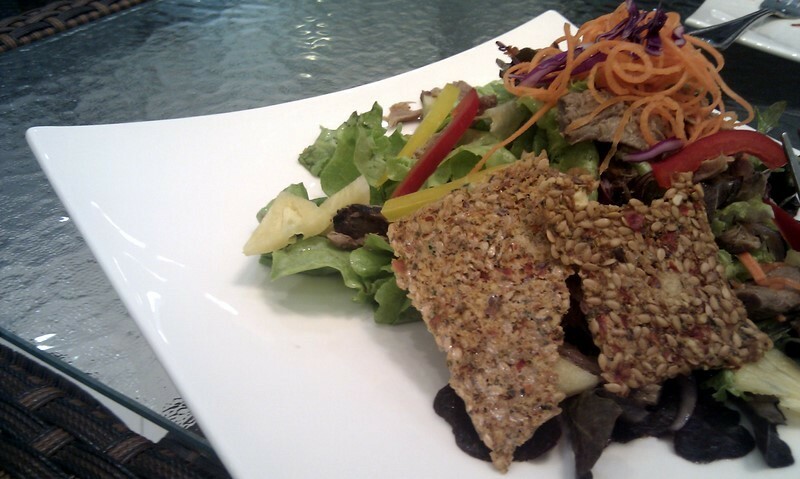 This was a mushroom salad thing with some of their crackers. Also good. 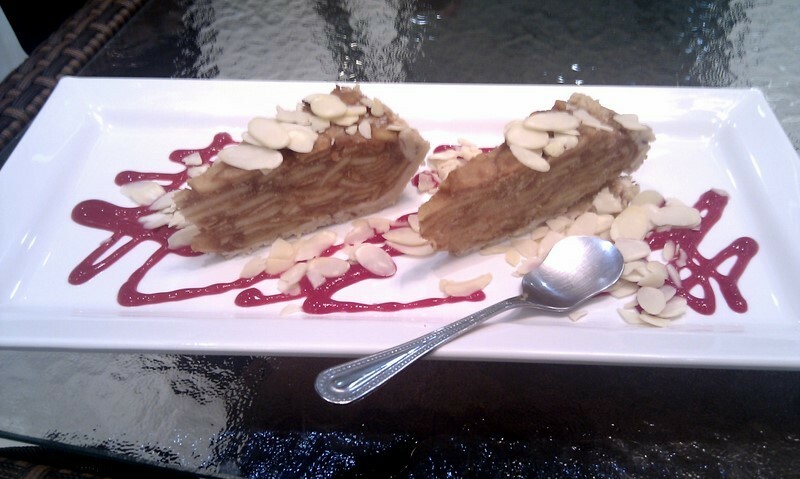 Apple pie for dessert. This was the only thing I wasn’t a huge fan of. It was still a bit frozen and lacked much flavour. Last Monday, I cooked a dinner for some dear friends who finish for the school year this week and by the time they come back, Seb and I will be off on to pastures new. I have to say that it was one of my proudest moments in the kitchen because I created some pretty awesome fancy pants things. I wish I had pictures for everything I cooked, but I will go through the menu. 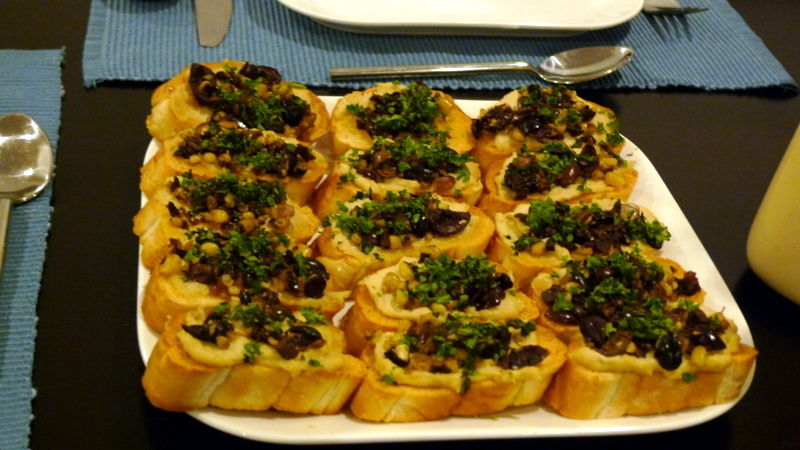 We started with these little brushettas; cashew cream with pine nuts and black olives to be precise from Color Me Vegan. 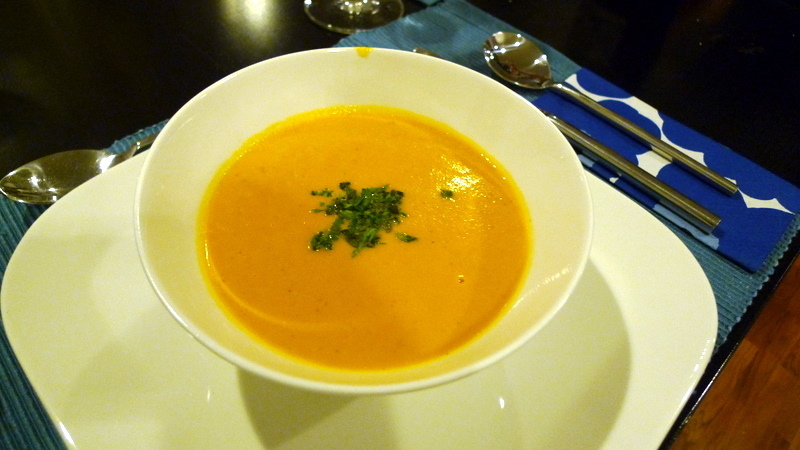 Then we had a tomato bisque. I got the recipe from Tal Ronnen’s A Consious Cook.I was given this beautiful book at Christmas from my sister-in-law and I finally got around to making something from it. It is very high-end veg cooking and rather labour intensive, but this dish was a bit more straightforward. It was so divine and creamy and the secret was Tal’s cashew cream. I’d love to cook more recipes from this based on the reactions people gave to this soup. For the main course I made carrot and avocado salad and miso and apple tofu. For dessert I made two ice creams; pistachio and butter pecan and a no bake chocolate pie. A wonderful night that reinvigorated my desire to cook for others. Christy is heading back to USA on Monday. Boo….. We went out for Japanese to celebrate. I’d never been to Uzuki Restuarant on Sukhumvit Soi 11 before. It was recommended by a friend as being quite vegan friendly and indeed it was. 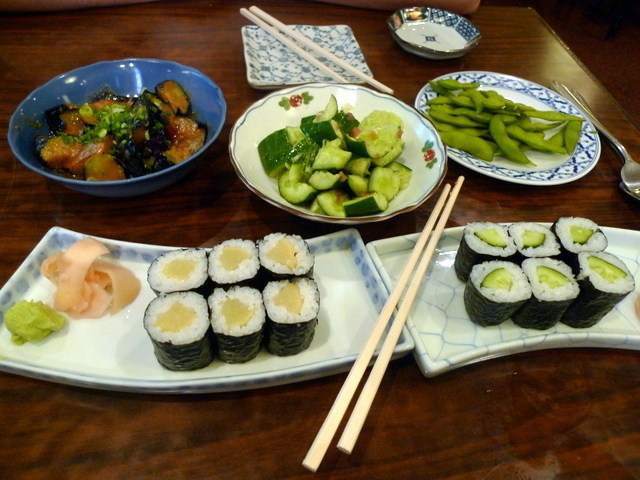 I am really new to Japanese cuisine and I have to say I am getting rather partial to it. The eggplant in miso sauce was outstanding. I also adore steamed edamame beans. While there is not the range of Chijuya, I’d go back just for the eggplant.